The hum-cancelling DiMarzio Ultra Jazz™ takes a traditional Fender® Jazz Bass® sound and really opens it up. Lows are deeper, highs are more percussive, and the mid-range is round but not muddy. Harmonic overtones jump off the strings. It's also quick; with instant response to either fingers or pick-style playing. There’s only one word for this combination of qualities: "musical". Choose the perfectly matched Ultra Jazz™ Pair, or try an Ultra Jazz™ Bridge pickup with a Split P™ in the middle position. Recommended for Bridge position. 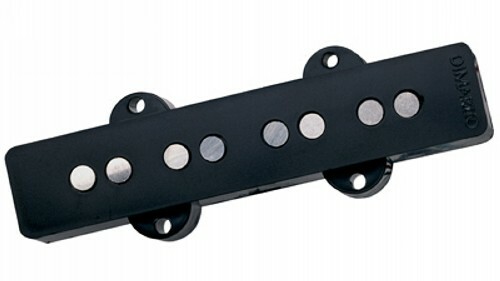 The Ultra Jazz™ Bridge was designed to fit the bridge position of the original Fender Jazz Bass, which has neck and bridge pickup cavities of two different sizes. Some current basses use the same length pickup in both positions. Please refer to the dimensions link for the correct choice for your bass.